Here's a scan of another one of these color sketches, this time of Poison Ivy. Well, it really could be any red-haired nature girl, but the foliage is poison ivy, so I figure that's enough. 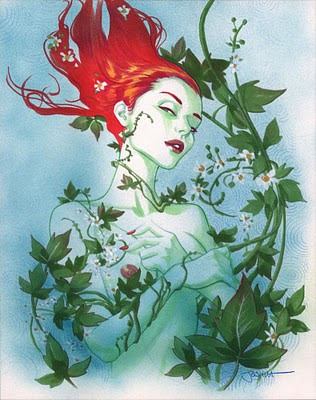 Ivy was actually the first one I did, followed by a Scarlet Witch, and then the Red Sonja. Apparently, I like red. 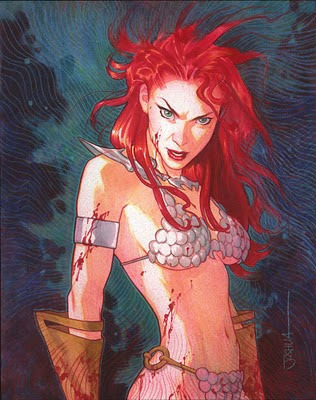 Also posted is a scan of the Red Sonja, as requested in the comments. I couldn't quite capture the subtleties of the original with my scanner, which I now realize is not great at color images. I'll have to upgrade if I keep working in color. Damn. Now that I am getting a little more comfortable with my materials, I plan on tackling some more involved subjects and more refined drawings. We'll see what happens. I'll post the Scarlet Witch once I get a good scan.